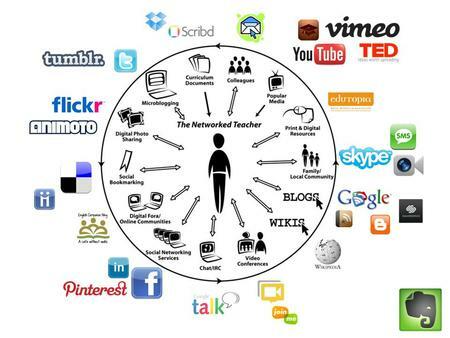 I've been researching Personal/Professional Learning Networks (PLNs) and Personal Learning Environments (PLEs) for some presentations on which I've been working. There are some great visuals out there that relate to these concepts. Among the most frequently referenced visuals that relate to PLNs are these by Alec Couros (part of his doctoral dissertation). I like the simple, yet explanatory, nature of these. 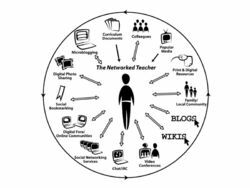 When I shared them with some colleagues I think it really helped them understand the scale and the collaborative nature of the "Networked" vs. the "Non-networked" teacher. It got me thinking about the tools I use to facilitate my learning environment (the visual on the right). So, I did an audit of the digital tools I use and came up with this list of 32+ tools you can use to grow your PLE. Naturally, some of these can fit into multiple categories but I placed them where I think I use them the most. I use Evernote for so much that I put it off on the side since it could probably fit into 50% of those other categories. I should stress that I use plenty of non-digital tools as well... for example, much of my colleague interaction takes place face-to-face. To refine even further, Google Reader and Twitter are probably the two places I learn from the most (more precisely, gather knowledge and information... my brain does the learnin', right?) and I would suggest people start there. Email - Amazing how this is still the primary tool I use for communication and sharing with colleagues... I'm working to change that! iTunes U - Get the app for mobile learning. March 16, 2012 by Brett Sparrgrove.